Following his work in northern New England, Ammi B. Young went on to design civic buildings around the U.S. Among these commissions were the U.S. custom houses in Charleston, SC and Boston, MA as well as the U.S. Courthouse in Richmond, VA. 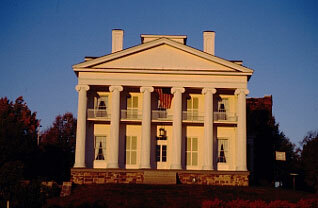 While all of these buildings continue to use the Greek Revival style that demonstrates Young's classical knowledge and skill, the Follett house remains one of his most successful buildings in this manner. Perhaps it is the residential dimensions of the house mixed with the monumental western façade that make it stand out among the rest. The proportions of the house and its basic box shaped massing allowed Young to focus less on the structural and form elements and more on its elaborateness and classical accuracy. Like many of the best architects of his period, Young designed the Follett house as a modern representation and melding of Greek components. In 1845 Follett became the first president of the Burlington & Rutland railroad. His house was a frequent spot for Burlington socialites. Follett's prosperity would soon come to an end, only thirteen years after he built his house. In 1853 he was forced to sell his home to Henry R. Campbell owner of the rival Vermont Central Railroad. The home changed hands several times after that. In 1892 it became a mission home for working women, then it was home to the Knights of Columbus, and then the Veterans of Foreign Wars. By the time the VFW sold the property to the Pomerleau Agency in 1978 the house was in serious disrepair. Following their acquisition of the Follett house, the Pomerleau agency began swiftly to restore it. Despite a damaging fire at the onset of the project, it was completed quickly and thoroughly. 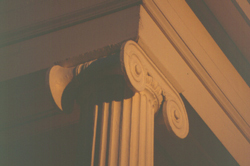 4 Thanks to the effort of all those who helped save the Follett house it remains one of the best examples of high-style Greek Revival architecture in Vermont. 2 Hill, Raplh N. "Follett House." Vermont Life. Volume 35, number 3. Spring 1981. 3 Summerson, Sir John. The Classical Language of Architecture. Cambridge, MA: MIT Press, 1963. 4 Stvan, Reed. "History of the Follett House." Compliments of the Pomerleau Agency.